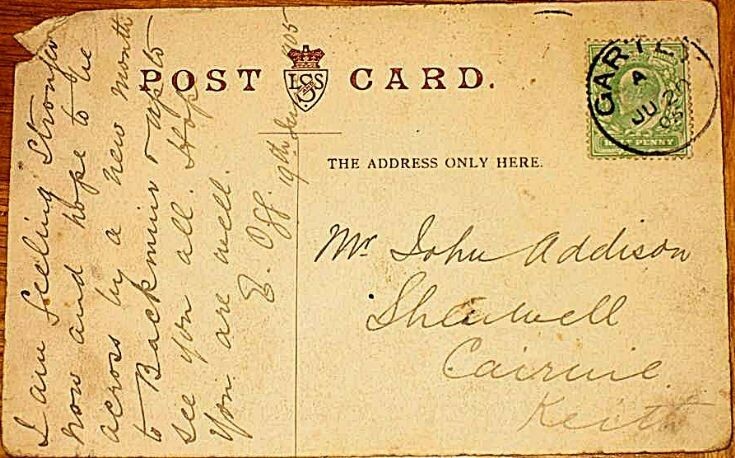 This is the reverse of the Post card picture of Glenbuchat Castle was sent in 1905 by ?C Ogg to Mr John Addison, Cairnie one of the Addison Family. If you look at the end of the Addison Family tree, in the paterson family, you will see that Elizabeth Paterson maried Charles ogg of the Baltimore Ogg dynasty. Is this the Mr Ogg in the post card?